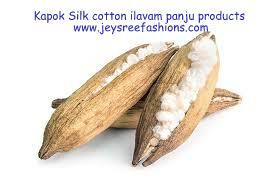 Benefits of Kapok Silk cotton (Ilavam Panju) As per Avvaiyar quote on her aathichudi, Sleep in silk cotton gives benefits more in human health than normal pillows which are stuffed with chemical and artificial contents. Organic Kapok Silk cotton (Ilavam Panju) products can work wonders. They add so much softness and comfort, while the colours and patterns add atmosphere and your personal style. Getting new cushions or covers is such a quick, affordable way to freshen up a room that you can do it whenever you feel like a change. Kapok Silk cotton fiber is harvested from the fluffy fiber surrounding the seeds of the tropical kapok tree (ceiba pentandra). Also known as "silk cotton," kapok is the lightest natural fiber in the world, with a density nearly five times as light as cotton. This adds a light and fluffy feel to our bedding products. Kapok fibers are hollow, which helps them function as a thermo-regulator. The fiber is also resistant to water, helping wick away moisture for a more comfortable sleep. Naturepedic uses only certified organic kapok, ensuring fair treatment of workers and environmental sustainability of our tropical forests. It is grown without toxins, synthetic pesticides, synthetic fertilizers, or GMOâ€™s (genetically modified organisms).